Boy howdy, Americans really know how to enjoy cereal. It’s kind of like cartoon food—insanely sweet, garishly colourful and mostly fake. But it’s FUN! 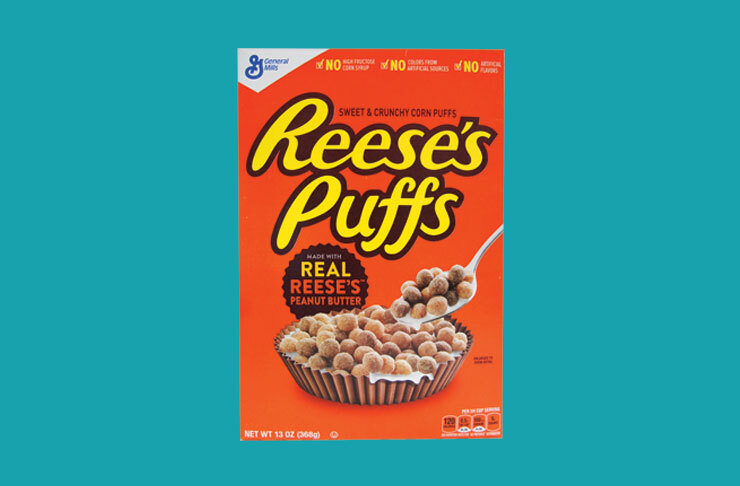 While us Aussies are over here eating Weet-Bix and Sultana Bran like a bunch of nerds, Americans are crunching into Reese’s Puffs – a cereal version of Reese’s Peanut Butter Cup chocolates. Are you offering me actual lollies for breakfast? Aw yeah, pass the milk! I love American food. I’d eat burgers, mac n’ cheese and tater tots every day if it didn’t mean becoming bedridden and having to wash myself with a rag on a stick. It's a cuisine you can sum up in two words: f*ck it. ‘Let’s have fried chicken AND waffles at the same time!’ ‘I want spray cheese in a can!’ ‘Let’s melt marshmallows over that pumpkin pie!’ ‘Pizza crusts are boring! Let’s stuff them full of hot dog chunks!’ Geez, America, where are your parents? So, let’s try American cereal! Join me on the couch as we watch Sailor Moon and eat Lucky Charms until we start screaming and hitting each other. Man, these crunchy golden pillows are freakin’ addictive. They’re kind of buttery, but also sweet. I couldn’t physically get them into my mouth fast enough—it was kind of stressful. 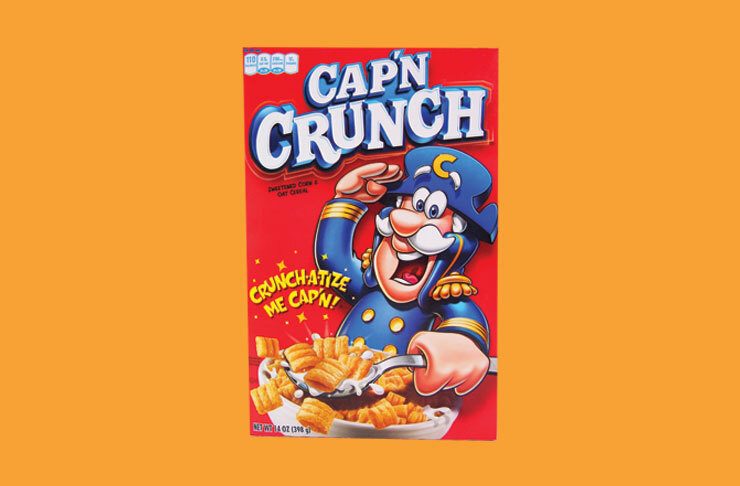 I’m not sure Cap’n Crunch is the right name for this product though. It should probs be called ‘Magical Wizard Crack’ or something. Seriously you could bag these up and sell them through school fences for $10 an ounce. Health benefits: Teaches kids about the importance of hierarchy on naval vessels. The dad who keeps Reese’s Puffs in the pantry is the same dad who picks you up from school on Friday afternoon in his dinted Toyota Celica, hands you $50 "because you’re a good kid, don’t tell your mum" and takes you to see Con Air at Northland Shopping Centre. Health benefits: Peanut butter cups contain traces of peanut butter, and peanut butter contains traces of peanuts, and peanuts contain traces of fat. When served in a bowl with milk, these don’t necessarily look like turds. They should probably put that on the box. Anyway, it's all about context: just imagine if you went into the toilet at work and dropped five or six of these into the bowl? And then you did this every day...how long would it take for an email to be sent out asking the perpetrator to stop? "Attention all staff. Please flush and start eating some fibre". 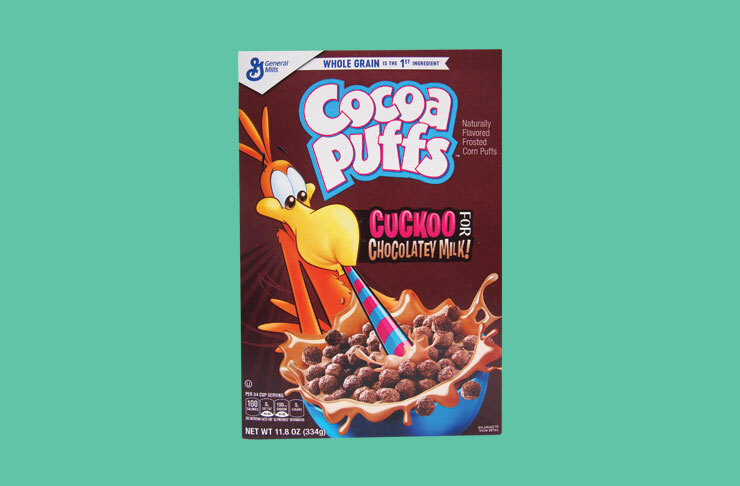 Health benefits: Considering some Cocoa Puffs ads feature Sonny the Cuckoo Bird in a straight jacket with his pupils spinning like sorcerous pinwheels...we're guessing not many. This looks like dry dog food with Play-Doh in it. 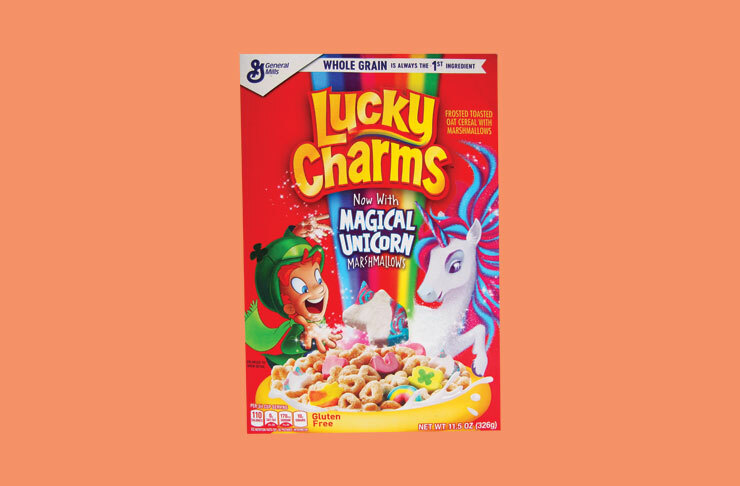 The ‘charms’ (aka, chalky sugar nubs) are shaped like hearts, moons, rainbows, clovers, and decapitated unicorn heads. 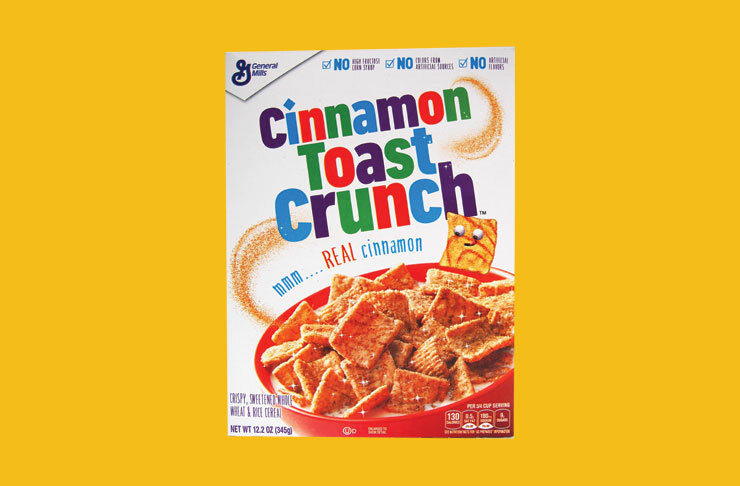 These are mixed in with comparatively plain cereal pieces in the shape of ancient Celtic runes. I’ll let you in on a secret—if you lay the rune pieces out in the correct combination and chant ‘Fiddle-dee-dee, where is Lucky?’ a leprechaun will appear. Be warned though, he will take up residence in your wardrobe and you’ll need to secretly feed him potato peels. You will drink Guinness together and form a bond deeper than any friendship you’ve known in this world. You know, kinda like ET, but with an Irish midget. Health benefits: Look, it could be worse. You could feed your kids plutonium. Health benefits: Happiness and existential fulfilment. Tricks the (party) Rabbit looks like he’s at an Ibiza ball-pit rave and the BEAT JUST DROPPED as the Red Food Dye 40 was kicking in. Wooooooop! Doof! Doof! Doof! Doof! 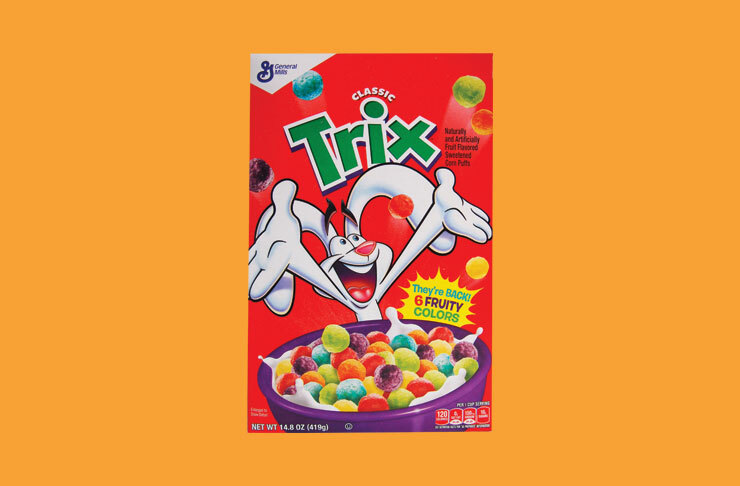 Unfortunately, Trix was found dead in his hotel room the next morning after drowning in a bathtub full of milk. Health benefits: Any food product that substitutes an 'x' for 'cks' is not going to help you win an Olympic gold medal. Honey Smacks (named Sugar Smacks until the ‘80s) contains a whopping 56% sugar. That’s the same as eating two Krispy Kreme doughnuts for breakfast. But that’s not all I learnt from Google. In the past week, Honey Smacks has been linked to a Salmonella outbreak, with 73 people infected and 24 people hospitalized. People are now suing Kelloggs. Is anyone surprised? There’s no way that punk frog washes his hands. 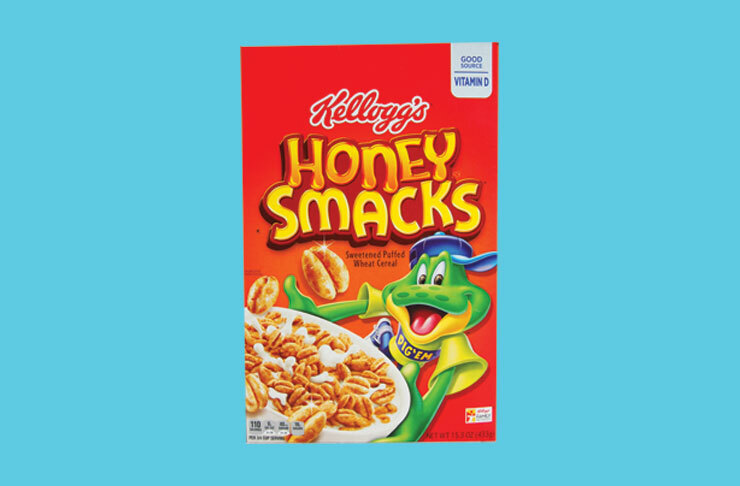 Health benefits: If you were a bee, the sugar content from a single box of Honey Smacks could probably keep the hive buzzing for about 1000 years. Miss the good old days? We've got a round-up of 90s lunchbox snacks over here. For more reviews, follow Simone on Instagram @snackreview. Simone is a designer, author and meme hunter. When she’s not hunched over a laptop, you’ll find her wearing an ugly jumper, spinning in an office chair and repeatedly asking colleagues if they remember Sizzler cheese toast. Snacks make up 87% of her brain. Find her on Instagram @snackreview.